I knew from walking this dog at the shelter many times that when I took him home with me I would not want to walk him with just a collar and leash. Walking a dog this way is hard on their neck and throat, and can do permanent damage. 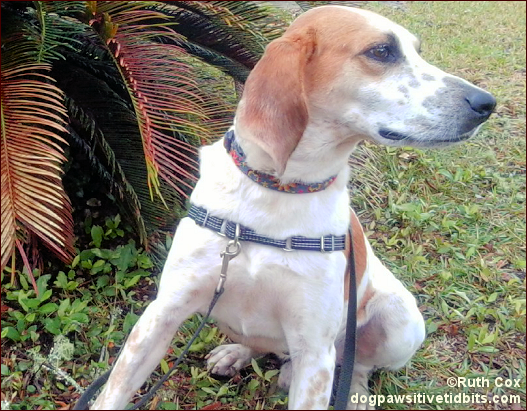 This coonhound was a "puller" and would need a harness with a front D-ring on the chest for control, as well as some much-needed leash training. 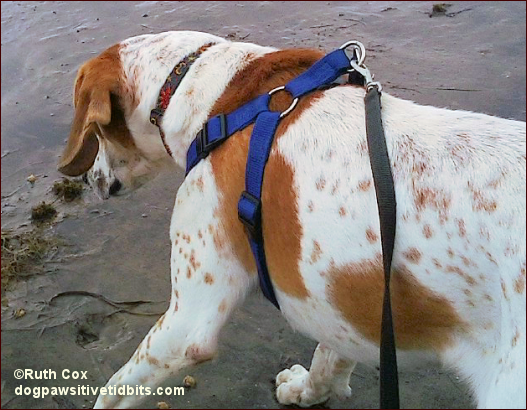 I, myself, had never walked a dog with a harness so I would be in training too! My dog Valentino wearing his Easy Walk dog harness. Before my (then) foster dog arrived in my home I had ordered his first harness. 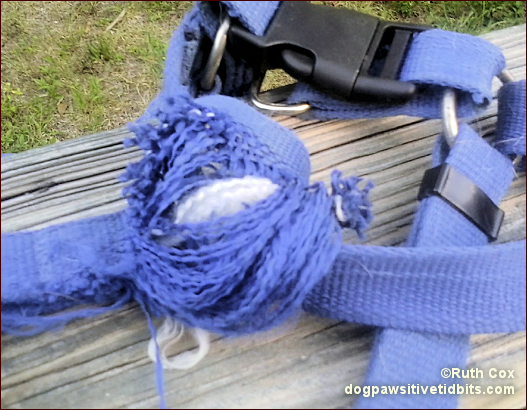 I read many harness reviews and received many suggestions from friends who are dog lovers like myself. 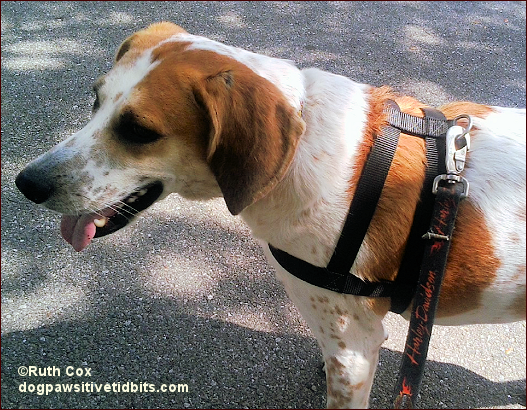 I settled on the PetSafe Reflective Easy Walk Dog Harness. This harness allowed me to leash train the dog, Valentino, with ease. To his credit, Valentino was a smart dog and eager to please this woman who had opened her heart and home to him. Further, the dog could wiggle around and climb right out of this harness. This is definitely not a good thing with a hound dog, especially one who has not yet been trained to stop or come when called on command! My dog Valentino beach combing in his nylon harness. Two weeks later, while at the shelter for an after being neutered check-up, we traded our Easy Walk in on a gently used nylon harness available in the shelter's pet accessory box. Although its tag was missing, the harness was much like the Rogz Utility Extra Large 1-Inch Reflective Lumberjack Adjustable Dog Step-in-Harness. Now, this step-in-harness had its D-ring on the back, so this was something both the dog and I would have to become accustomed to. I found myself in training mode with him a lot more to keep him from pulling, but our schooling on dog walking paid off eventually and we enjoy our walks together now. Still, my Houdini hound could easily wriggle right out of this harness too when he wanted to go in a different direction than I wanted him to go. He only did this a couple of times, as our training had progressed to where he listened to my commands — most of the time! Also, this gently used harness had a loose thread hanging when I got it. I snipped it and burned it to keep it from unraveling, but eventually it would work loose and unravel some more. I'd cut again, even tried superglue applications and such, but I knew that soon the nylon would give way. Sure enough, last week my (now adopted) dog Valentino caught a glimpse of that string hanging under his belly and couldn't help but gnaw on it and sure enough the harness gave way. It shredded like lettuce! But of course, there are no pet stores nearby. I called my vet, who is a half hour away, as I remembered they sold a few dog products like that in the waiting room. None Valentino's size! The vet receptionist did let me know that a few miles down the road there was a good pet store that had a variety of dog harnesses. As a temporary quick-fix I bought this inexpensive one he is now wearing. It had no manufacturing label on it, only the store label, so I have no idea from whence it came. My dog Valentino sports a temporary harness from Oysterbones pet store. Even though it seems this harness is a one-size-fits-all big dogs, it has one good thing going for it — Valentino can NOT back out of it! I began searching online and via social site friends for a cure for my harness hunting dog dilemma. I have decided I want a "real" harness for Valentino. I want it to be a bit more than just a few straps clipped together for dog walking. And, I would like it to be the last dog harness I have to buy for Valentino! Having looked at over 100 harnesses online and reading hundreds of reviews on them, I am looking at purchasing something like this Ruffwear Web Master Harness. In fact, I even called the newly discovered pet store to see if they have the harness. They do not, but... The gal I spoke with invited me to bring my dog into the store and said we could try a few on him. This coming Monday, I plan to take Valentino on his first pet store shopping spree. We are going to OYSTERBONES in Apalachicola, Florida to find the harness of our dreams for my dog! If you have a dog harness to recommend, write a review and add your link this week with PAWSIT Hop Saturday! You can submit your links any time throughout the week.